I love weddings – I mean what’s better than committing yourself to someone for eternity in front of all of your friends and family? The downside to weddings is that they can be so expensive! So much time, money, and effort is placed on a wedding – and sometimes not enough on preparing for the marriage. Many people opt out of having a wedding because it lasts only a few hours, leaving you with lots of bills and a few pictures. 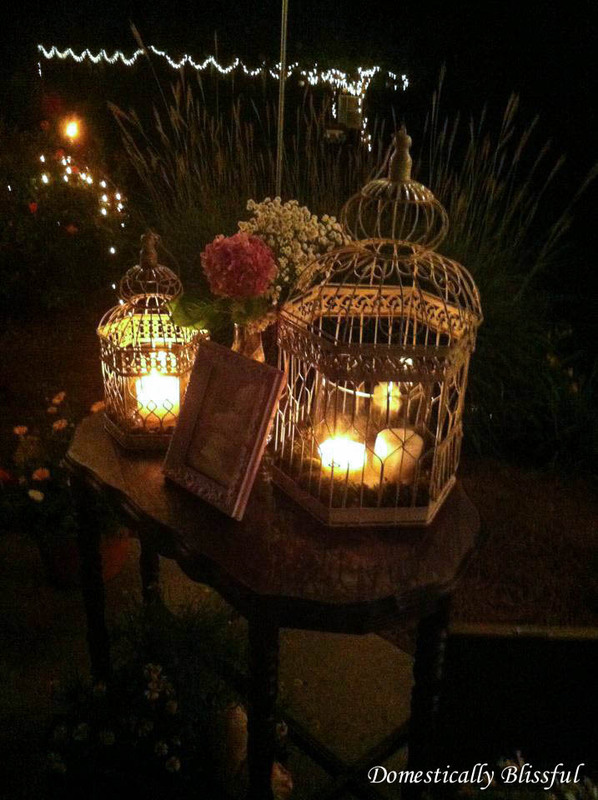 Framed Quote on an antique table amongst birdcages filled with moss and candles. Photo by a family friend. I was not one of those 2012 brides who averaged $28,427 for their wedding. 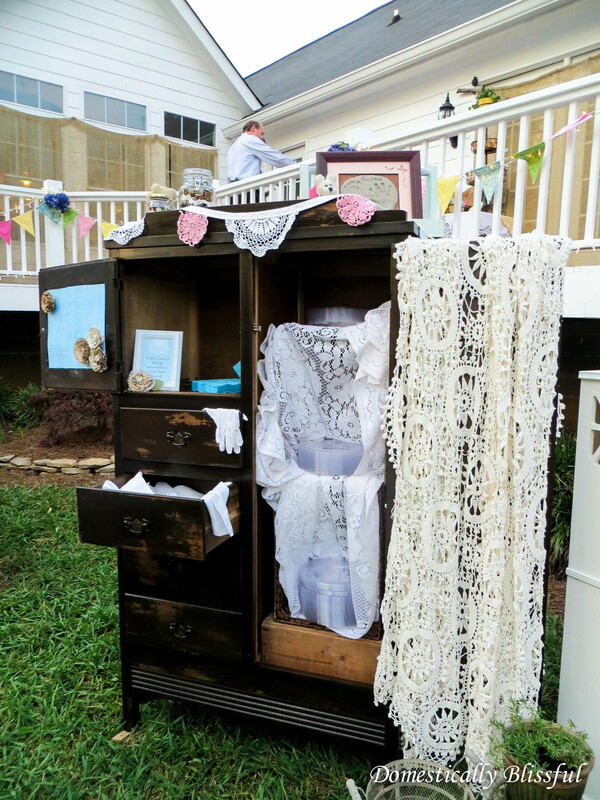 I was a diy bride who wanted a return for her work and money. 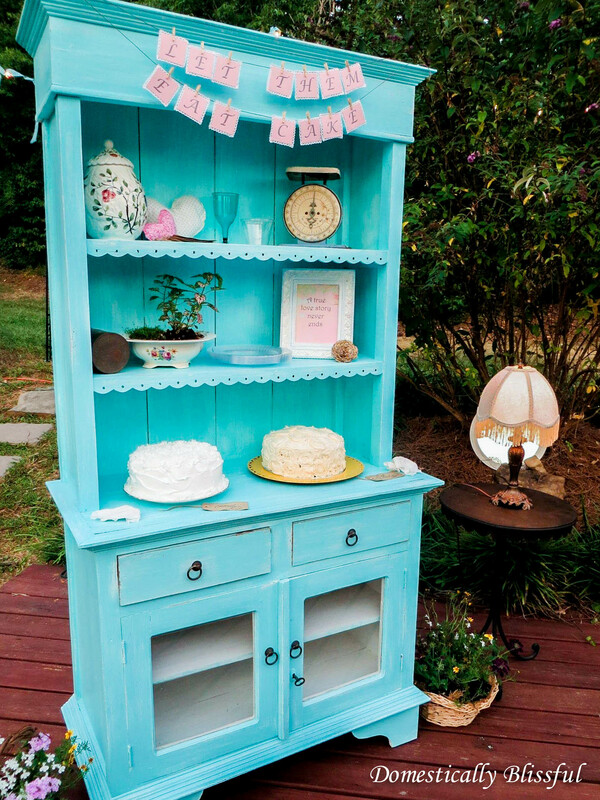 That’s why when planning my wedding and reception decor we went with things that could move from our wedding/reception decor to home decor. Framed Quote on a shelf in an antique wardrobe – this was filled with silverware, plates, and napkins for the dessert extravaganza. These Framed Quotes were one of the simple DIY projects that I used for our wedding that now decorates our home. 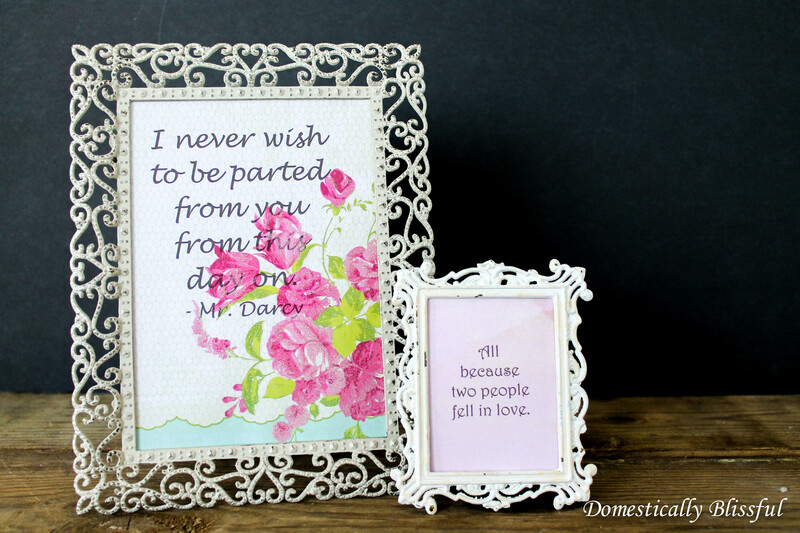 I made around a dozen or so of these framed quotes for our special day – I just love double duty decor! Same Framed Quote as above – I just love the ambiance! Frames – I bought mine at yard sales, second hand stores, antique malls, and flea markets. Scrapbook Paper – Joann’s and Hobby Lobby have a great selection, just don’t forget the 40% off coupon! Framed Quote amongst the half dozen cake options at the dessert extravaganza. First, gather your frames and a list of your favorite quotes. If you have beautiful handwriting – lucky you – you can write your quotes on the scrapbook paper, cut them to size and add them to your frames. However, if you are like me – handwriting like a doctor without any such degree – you will need to type up the quotes in your favorite font and print them onto your scrapbook paper. Then cut your scrapbook paper quote to size and frame it up! I was a little OCD with this part – I measured my paper and adjusted the measurements on my word document so that the quote would print on the prettiest parts of the scrapbook paper. 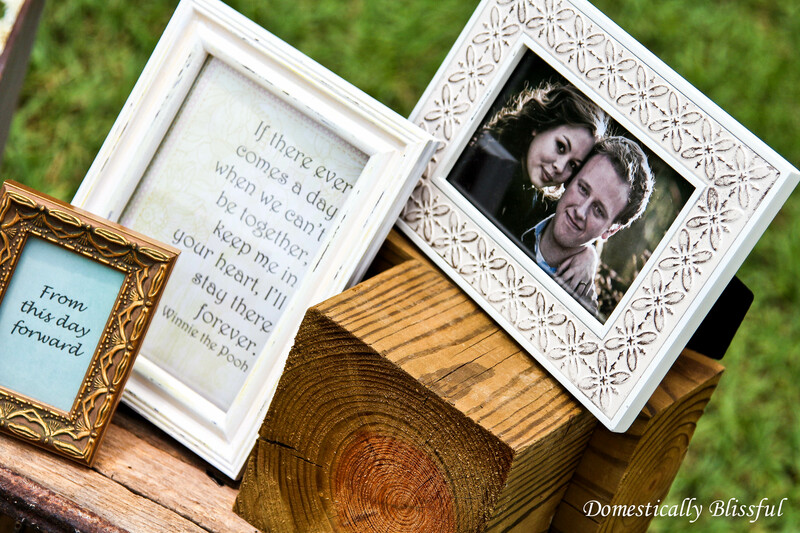 These Framed Quotes were great for our wedding and reception decor and they have transitioned nicely into home decor! 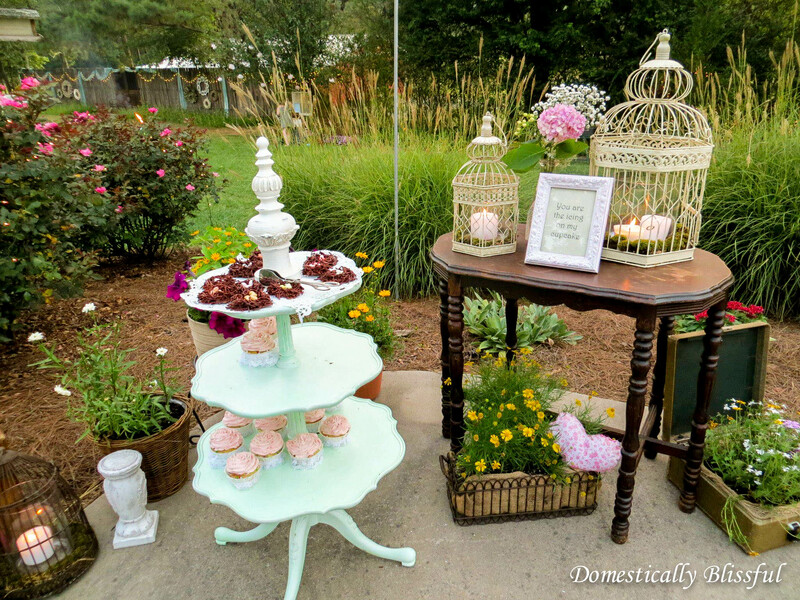 PS If you want to see other DIY Wedding ideas you should check out Domestically Blissful’s wedding series!